Recently GSA Archives had an enquiry from Suzy Richardson – 4th year student at the University of Glasgow – regarding a floral ceramic set and GSA graduate May Wilson, a potential Glasgow Girl. After conducting research in our archives, as well as in the Mitchell Library and Glasgow Women’s Library Suzy provides more information about what her research has revealed on ‘GU Feminist History’. 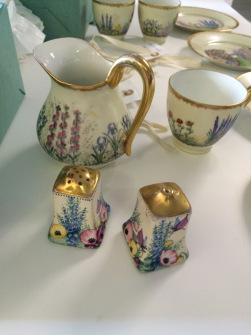 Glasgow Women’s Library welcomed a new treasure to their expansive archive collection this year; a beautifully hand painted ceramic cruet set donated along with an ornate china tea set. Vibrant water colour combinations, blooming flower studies, and delicate butterflies, each painted with meticulous care, all create a charming garden scene. Decorated by two different lady artists, the cruet and tea set (see Carole McLaughlin’s blog) and their story, are something of a mystery, but needless to say, a rather intriguing one. Signed and monogrammed ‘MW’ on the base of each piece, the cruet set was decorated in 1920. By the early twentieth century Glasgow had become renowned for being at the forefront of the development of art in Scotland, with the likes of Charles Rennie Mackintosh putting the city on the map, and it is likely that the cruet set was painted by ‘Glasgow Girl’ May Wilson, a female artist within Mackintosh’s circle. Identified under Glasgow School of Art’s student records, a May Wilson is noted as having attended between 1892-1893, aged fourteen. Little information is detailed of ‘Glasgow Girl’ May Wilson, just that she lived at Huntly Gardens in the West End and that her father was a factor, suggesting she came from a fairly well-off background. The period 1892-1893, however, may be too early for it to be the May Wilson who painted the ceramics, and without a date of birth it is difficult to altogether confirm whether she was the same ‘Glasgow Girl’ – May Wilson. Hopefully at some point, a piece of information will reveal itself that will allow us to confirm this fact. Nevertheless, during this period Glasgow was home to a flourishing number of female artists, most notable among them being the Glasgow Society of Lady Artists. While unfortunately May Wilson was never recorded as being a member, the society’s history is still worth discussing here because the club became a beacon for female art in Glasgow by the middle of the twentieth century. Established in 1882, the Glasgow Society of Lady Artists was pioneered by eight enterprising female students from Glasgow School of Art. Beginning with humble intentions of renting studio space to hone their painting skills, the club soon thrived and turned into a centre where due recognition of women in the field of art was accorded. The creation of a society of this nature – by young, independent women – was considered bold, especially as the nineteenth century was a time in which the emancipation of women was much in the air. By 1885, after assiduous enterprise and a swell in members, the talented ladies had enough money to move out of their rented studio space in Wellington Street, and purchase their own house at No. 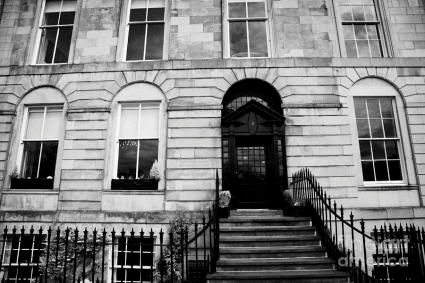 5 Blythswood Square. The society soon became renowned for its yearly exhibitions in Glasgow, where members displayed their work which ranged from portraiture and landscape paintings to silverwork and hand painted china pieces. In particular, a woman named Elizabeth Mary Watt became an artist widely regarded for her work in Scotland. Watt’s life deserves mention as she was among the generation of female painters that flourished in Scotland from the beginning of the twentieth century until World War II. Her story may well provide some measure of insight into the life of her near contemporary May Wilson. Born in Dundee in 1886, Watt started her studies at Glasgow School of Art in 1905, aged twenty. She began as an evening student in Drawing and Painting until 1908, when she won the Newton Prize for Life in Oil Colour and a £20 Maintenance Scholarship. The money gave her enough funds to study as a day student. Never marrying, Watt continued studying at Glasgow School of Art until 1917 and trained as an art teacher thereafter. With a sound education in art behind her, Watt became a prominent member of the Glasgow Society of Lady Artists. She was quickly recognised as gifted, noted especially for her landscape paintings, portraits, and decorated ceramics. The Glasgow Herald wrote in 1934, ‘Watt splashes colour gaily upon her pottery and china, achieving most unusual and effective results. Delicate designs are used…with their background of limpid hues throwing into relief the original flower patterns’. Feminine art had a preponderance for flower studies during this period. 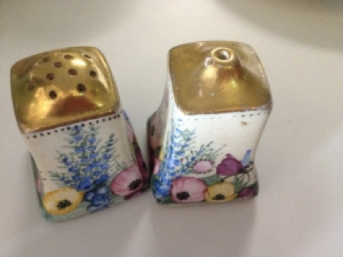 The designs on Wilson’s cruet set bear strong similarities to Watt’s decoration. The selection of cinerarias, primroses and bluebells by both artists were fashionable flower combinations, though Watt’s detail and pastel decoration shows more of an affinity with the Art Nouveau style, synonymous at the time with Charles Rennie Mackintosh. 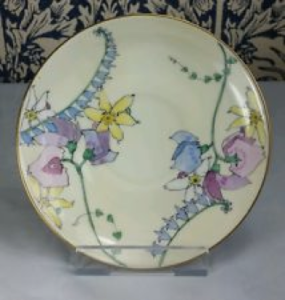 The Evening Times in 1923 credited Watt’s hand painted china as ‘outstanding for its delicacy and colouring’. Watt was unusual in that her craftwork sold well, supplementing her income as a teacher. In 1947 she was awarded the honourable Lauder Prize in recognition of her work. It is testament to her talent that her watercolours and ceramics remain valuable collectables in Scotland today. The recognition of female artists and gaining equal status with men was always a struggle. The Glasgow Society of Lady Artists was unique, however, in according due recognition to women in the field of art. 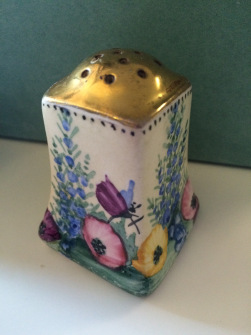 While it is disappointing to have uncovered little about May Wilson and the story behind her cruet set, it is promising to discover that many Glasgow women asserted their individuality through their art. And needless to say, whatever story lies behind remarkable pieces of art as Wilson’s cruet set, they remain potent symbols of female artistry in Scotland during the twentieth century. Please go to ‘GU Feminist History – Another ‘Glasgow Girl’ to see the original blog. Alphabetical Registers of Students 1881-1892, Glasgow School of Art Archives, (GSAA/REG/2/1). Alphabetical Registers of Students 1903-1919, Glasgow School of Art Archives, (GSAA/REG/2/3). Burkhauser, Jude, (ed. ), Glasgow Girls: Women in Art and Design, 1880-1920, (Canongate: 2012). 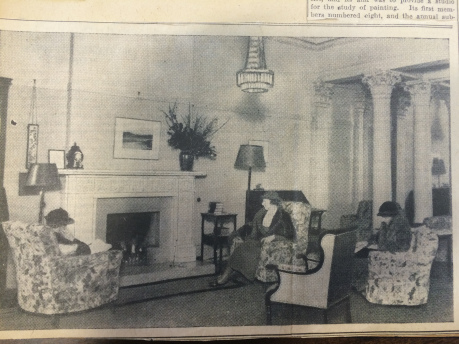 History of the Glasgow Society of Lady Artists Club, (1950), from Special Collections, Mitchell Library, (G. 706. 0141443 GLA). Glasgow Herald, from: Special Collections at Mitchell Library, (G. 706. 0141443 GLA). Evening Times, December, from: Special Collections at Mitchell Library, (G. 706. 0141443 GLA). The Scotsman, from: Special Collections at Mitchell Library, (G. 706. 0141443 GLA). 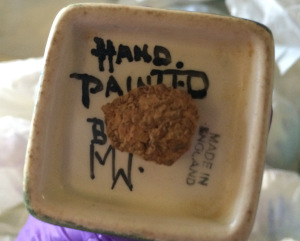 ‘Studio Pottery and Marks Hand Painted’, Scottish Pottery, Accessed 7/11/15.